Recently I’ve have heard a lot about the Schwarzkopf Supreme Keratin hair smoothing treatment. I am very interested in the treatment and have several questions. When I asked my stylist about it she told me she doesn’t offer any type of keratin treatments. She told me she feels they are concerning due to formaldehyde levels which were in previous versions of similar treatments from other salon treatments. My biggest concern with the Supreme Keratin treatment is that my hair has been dyed and highlighted for the past few years. I’ve heard Keratin can’t be applied to colored hair. Is that true? I’ve also heard that Keratin can have a high odor, regardless of how much formaldehyde the treatment contains, which requires special breathing masks or salon ventilation. What steps are required and what is the cost? Are the benefits worth all of the risks? Kudos to you for taking the time to do your research and determine if the benefits of a Keratin salon straightening treatment offers benefits worth the risks. Ultimately only you can decide what is best for you and your hair. Many stylists don’t offer the Keratin smoothing services for a number of reasons ranging from the concern over the potential toxicity of the chemicals utilized, the amount of time and work it takes to apply the treatments. Although all Keratin hair smoothing systems like Schwarzopf tend to be similar in application requirements as well as expected results, every manufacturer is a little different in how they formulate their Keratin smoothing chemicals. If you wish to learn more about Schwarzkopf Supreme Keratin hair smoothing system, which is guaranteed to be odorless and not require special breathing masks, visit the Schwarzkopf site. 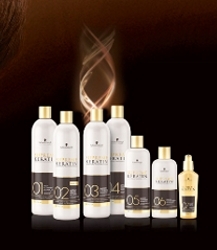 A Keratin specialist provides specific answers to a wide range of questions about the product. According to Schwarzkopf’s website Supreme Keratin can be applied on chemically colored hair. Hair can also be colored right after the Keratin treatment. Depending upon your type, texture and length of hair, the Supreme Keratin treatment is predicted to generally take an average of 2 to 3 hours. When considering any type of chemical infused treatment, Schwarzkopf or not, it’s always wise to book a paid per-application consultation with the hair professional who will apply the Keratin treatment to your hair. Bottom line, it’s your hair and only you can ultimately decide if the results are worth the risks. One Response to "Keratin Smoothing"